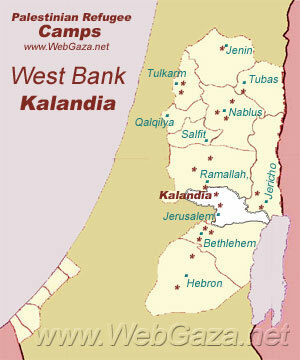 Kalandia Refugee Camp - Where is Kalandia Camp Located? 52 villages in the Lydd, Ramleh, Haifa, Jerusalem and Hebron areas. Like other West Bank camps, it was established on land UNRWA leased from the government of Jordan. Where is Kalandia Camp Located? The Israeli authorities consider this area as part of Greater Jerusalem, and the camp was thus excluded from the redeployment phase in 1995. Kalandia camp remains under Israeli control today. All shelters are connected to public water and electricity infrastructure. Most units are also connected to a sewerage system that was only designed for liquid waste and is unsuitable for refugees’ needs. Since people often make the connection to the sewerage system themselves, it often leaks. The Jerusalem Water Company replaced the network without coordinating with UNRWA in 2007, thus destroying paved roads and worsening camp conditions overall. The shelters lack ventilation. Almost one in five residents is unemployed.